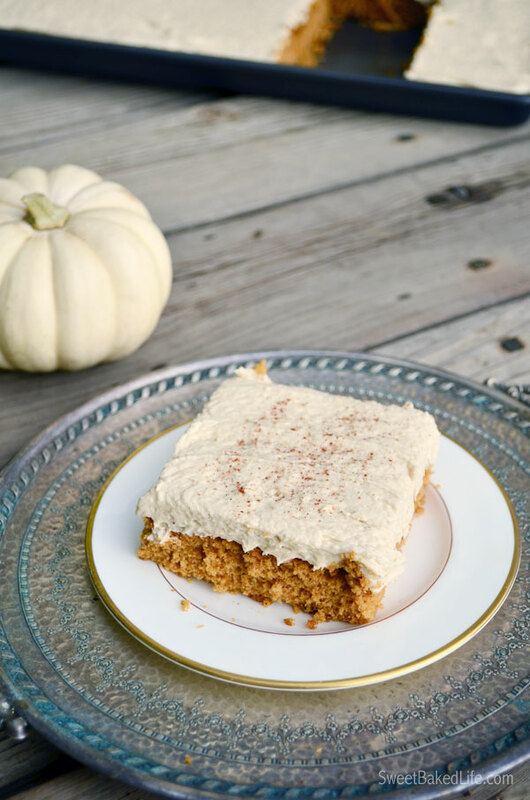 Get ready for sweet fall comfort food with this amazing Pumpkin Spiced Cake with Brown Sugar Buttercream Frosting! Now just saying that was a mouthful! Ok, I know the name of this recipe is long, but you’ll be glad to know that preparing this recipe is easier than saying it! LOL! And this is unusual for me, as I normally have really short recipe names. But for some reason, just could not keep this one short as I wanted to describe every delectable ingredient! 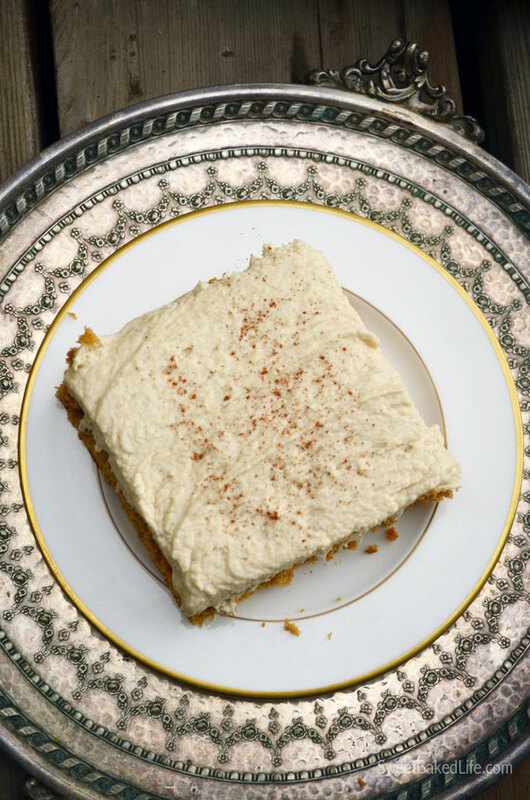 You see, I had an idea that I wanted to make a fall-inspired spice sheet cake. I knew that I either wanted to add pumpkin butter or apple butter to the recipe to really make the flavors stand out. I also had a vision of the type of frosting that I wanted — a warm marshmallow frosting. Now, I am not talking warm to the touch, but rather warm from some type of spice. So, when I wandered through my local Trader Joe’s, something instantly caught my eye that I knew I was going to incorporate into my cake recipe. Pumpkin Pie Spice Cookie Butter. Yes, you heard me correctly! If you are a fan of the Trader Joe’s incredible Cookie Butter, you are going to LOVE this stuff! After I put my jar of the sweet stuff in my cart, I wandered down an aisle that was filled with everything pumpkin; from pumpkin spiced pumpkin seeds to iced pumpkin scone cookies and everything in between. The gal stocking the shelves said how amazing the pumpkin spiced pumpkin seeds were (she was right as I got these too!). I immediately asked her if she tried the Pumpkin Pie Spice Cookie Butter. Even though she said it sounded really good, she had not actually tried it. I immediately started telling her about my cake concept. As my son stood by my side and began rolling his eyes, however, her eyes got wide and she seemed to be in awe of my description. It was kind of like I put a sweet baking spell on her! I also suggested this pumpkin cookie butter would also probably be great slathered on a pear or even topped over some cream cheese on a baguette. YUM! After working my magic, I tossed a bag of the pumpkin spiced pumpkin seeds into my cart and went on my merry way, marveling and dreaming of my cake! Which by the way, turned out so darn good with the addition of the Pumpkin Pie Spice Cookie butter. It was fluffy and the flavor was incredible! And for the frosting, well, to give it the “warmth” I was looking for, I added some brown sugar and cinnamon to my basic marshmallow buttercream frosting. Ah, can we say, Over. The. Top. Yep, you’re gonna love this! 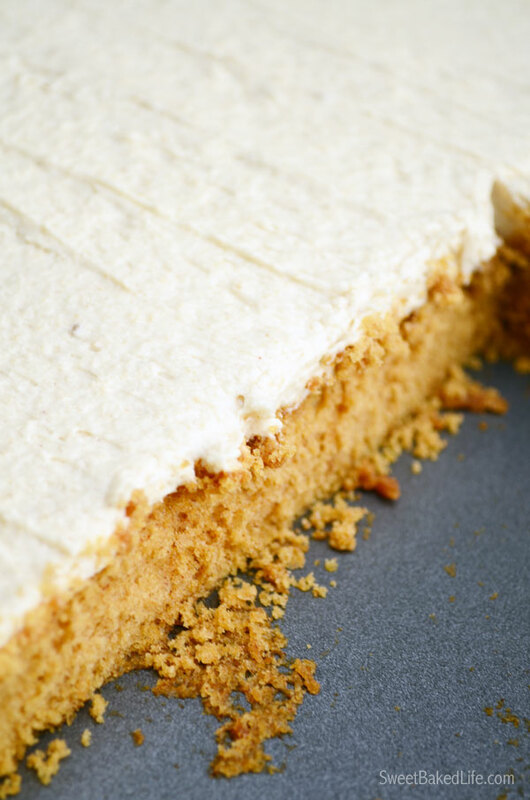 The frosting is ultra smooth because of the marshmallow cream, yet it’s got an incredible texture because of the brown sugar. And the cake and the frosting together — well, believe me, you will not be able to keep your fork away from it. Probably one of the best cakes I have ever made! Heat your oven to 350 degrees. Spray a 18×13 sheet pan (or jelly roll pan) with non-stick cooking spray and set aside. In a large bowl, add the eggs, pumpkin pie spice cookie butter, melted butter and almond milk. Whisk until well blended. Then add the spice cake mix and using a hand-held mixer, beat on medium-speed for 2 minutes. Pour the cake batter into the prepared pan and bake for 20-22 minutes; until done. Remove from oven and let cool completely on a wire rack before frosting. To make the frosting – to a large bowl of an electric mixer with the paddle attachment, cream together the butter, marshmallow cream, cinnamon and vanilla extract until well blended; about 1 minute. Add the light brown sugar and mix well. Then add the confectioners sugar and the cream. Beat until you get the texture you want. If the frosting is too thin, add more confectioners sugar, a little at a time or if it’s too thick, add more cream, one tablespoon at a time. Pour frosting on top of the cooled cake and spread evenly with a rubber spatula or off-set knife. 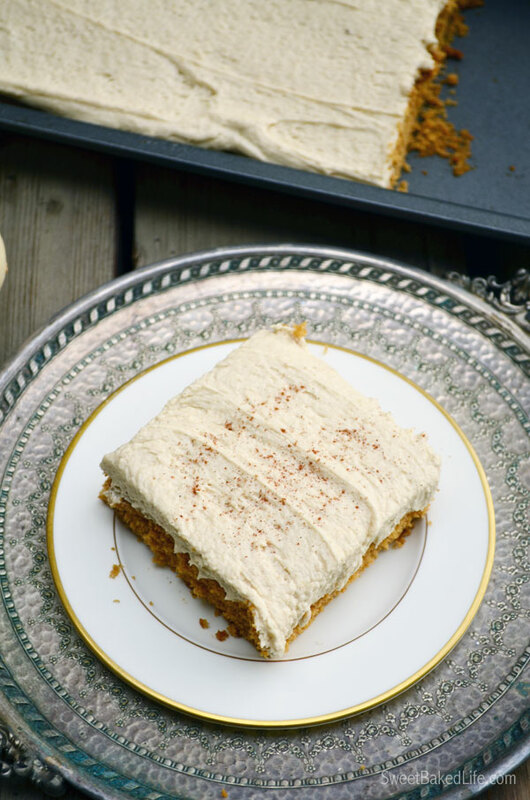 Cut into large squares, sprinkle with some cinnamon and enjoy! 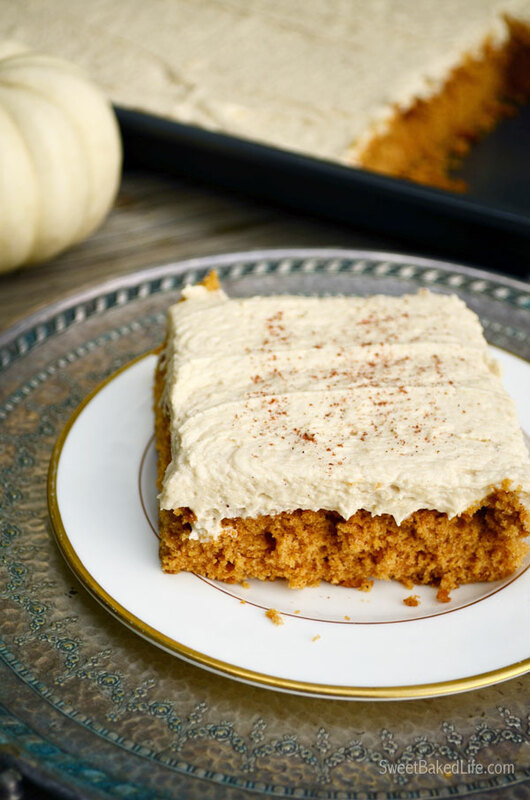 Now making this Pumpkin Spice Cake with Brown Sugar Marshmallow Buttercream Frosting is defiantly my way to welcome the fall. Oh, and wishing you a Happy Halloween too! Agree with Patricia – this looks so good, such more-ish flavours. Happy Halloween! Hi Sheila I’ll have to see if I can get my hands on some! 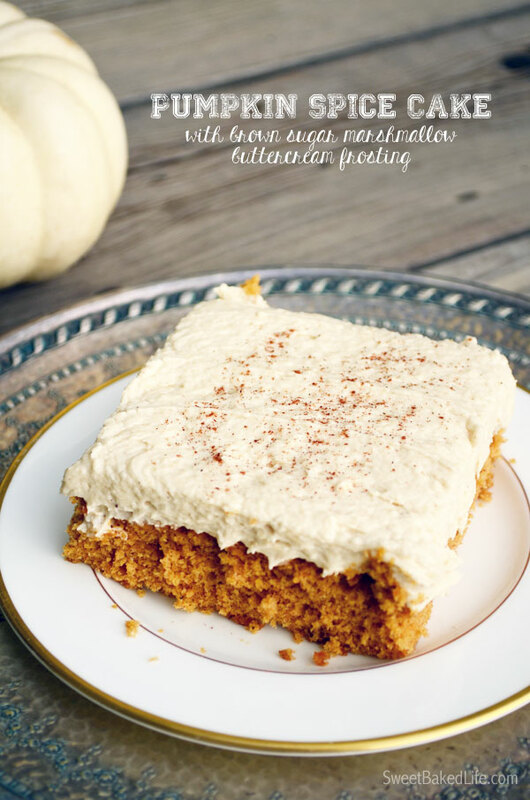 I am in love with pumpkin baked goods! It isn’t really ‘a thing’ to have sweet pumpkin things in Australia – we eat it like potato – but I am doing my best to change that 🙂 This cake is marvellous.